Heifer Armenia, with government and World Bank support, unites small-scale farmers into vibrant communities to recharge the country’s agricultural economy. Vagharshak Nikolayan, age 74, and his family depend on their two cows for milk, cheese, butter and sour cream to eat and sell. KHOZNAVAR, Armenia—Vagharshak Nikolayan, 74, survives the same way most of his neighbors do: by farming. There is no other industry in this mountain hamlet, and the road to Yerevan, the capital city where paying jobs can be found, is winding and long. Two of his three children have left Khoznavar, the village of about 100 families 200 miles southeast of the capital. Vagharshak Nikolayan and his wife, Aida, 72, share the stone house his parents built in 1933 with their remaining son and his family. The six people in the household depend on their two cows for milk, cheese, butter and sour cream to eat and sell. They use cow patties to fertilize their fields and to fuel a wood stove that’s used for both heating and cooking. “The whole community lives thanks to cows,” Aida Nikolayan said. “Otherwise they will die from hunger.” It is a story repeated in many Armenian communities and the inspiration behind the $23.33 million Community Agricultural Management and Competitiveness (CARMAC) project. The project launched in 2011 when the Armenian government secured a loan from the World Bank and enlisted the help and expertise of Heifer Armenia. The five-year program will make small-scale agriculture, an occupation practiced by 40 percent of the population, more profitable and sustainable by establishing cooperatives and improving pasture management in 55 communities in Armenia’s mountainous regions. It is based in part on international and national studies that found that Armenia has a vast, untapped potential in livestock breeding. The first phase of the project will help nearly 24,000 Armenian families. A tiny country with a population of just three million, Armenia is haunted by its history. During Soviet times agriculture was controlled by the state through collective farms known as kolkhoz. The government owned all machinery, land and livestock. Villagers were employed in a single part of the farming process, perhaps driving a tractor or baling hay. They had little knowledge or say in what was grown and where it was sold. Full milk containers sit on the Nikolayans’ porch. The communal system collapsed after independence in 1991. Machinery and animals were dispersed to individuals, while pastures were given to the community, said Gagik Khachatryan, director of the project implementation unit at the Armenian Ministry of agriculture. Villagers used to working on kolkhoz, where they performed a small part of a larger process, were ill-prepared to farm on their own. For the last two decades they worked without proper equipment, training or supplies. When they needed to cut or bale hay, they had two options: rent from owners of the few private tractors or rely on rusty Soviet relics. Overwhelmed by requests, the private owners sometimes took as long as a month to fulfill orders. The Soviet machines were even more unreliable. Remote pastures quickly fell into disrepair, forcing villagers to overuse nearby pastures, straining the environment and depriving livestock of adequate nourishment. During the global recession of 2009, Armenia’s economy shrank by more than 14 percent. Although things have improved, a large proportion of the labor force still travels abroad for seasonal work, leaving fields fallow. The goal of CARMAC is to change this by targeting not one or two families, but entire communities, said Heifer Armenia Program Manager Vahe Sardaryan. The project has four components: pasture/livestock management system improvement, strengthening agriculture support services, establishing agro-businesses through competitive grants and management. Heifer focuses primarily on the first and main component. The mountain hamlet of Khoznavar, Armenia. The CARMAC project will improve the roads leading to remote pastures, install watering points and introduce pasture management strategies. The project will also boost nutrition for livestock, thereby increasing milk and meat production. Additionally, project participants will have access to new, reliable tractors they can rent at a reduced cost. The collective rents the tractor to its members at an average 25 percent discount for baling and a 15 percent discount for cutting. The discount will increase once the collective is given its own secondary equipment and doesn’t have to charge members additional money for the baler it must now rent from private owners. The money they collect is set aside to be passed on to another community for the purchase of equipment, fulfilling Heifer’s requirement to Pass on the gift. After decades under Soviet rule, some farmers in Khoznavar were reluctant to sign on to a collective project. But savings generated by using the new tractor won people over, collective leader Mher Grigoryan said. Khoznavar Mayor Varo Grigoryan, agreed that savings was key to acceptance of the project. When they initially heard the word “collective,” villagers were reminded of the unpopular kolkhoz, which left them in the dark as to what was being produced and where it was being distributed. “But in this model I understand what is produced, how it is produced and that’s why I have decided to join,” Nikolayan said. The Nikolayan family’s initial savings from using the collective’s tractor rather than renting from a private owner seems minimal at about $30. But it becomes more substantial when the couple’s combined monthly pension of $220 is considered. It was enough to convince them to cultivate more land to plant wheat, barley and alfalfa. Like many of his neighbors, Vagharshak Nikolayan is enjoying the security that comes with being able to provide for himself and his family. Mher Grigoryan shows off the new MTZ-821 tractor members all use as part of the CARMAC project. Providing money for equipment purchases is part of the Passing on the Gift requirement. “One thing that has changed in the village is the kind of dignity of people now that they are not obliged to ask [for help] anymore,” he said. And the CARMAC project is already yielding measurable benefits. Although the project has only officially been in place a year and a half, cattle numbers have increased by 14 percent. Even more telling, said Heifer’s Sardaryan, is that “a 20 percent increase in dairy productivity has already been reported in some places.” Mayor Grigoryan hopes the changes will convince more people to stay in Khoznavar. At a time when most Armenian villages struggle with emigration, Khndzoresk is growing. In 1995 this village 170 miles southeast of Yerevan had a population of 1,950. Now it numbers 2,350, far less than the 8,200 it had at the beginning of the 20th century, but impressive nevertheless considering the declining numbers around them. The village lost people during the Soviet purges of the 1930s and ’40s when residents were exiled to Siberia or simply fled. Now they are in danger of losing them to migrant work, but Mayor Sergey Hayrapetyan believes CARMAC can keep that from happening. “When people think you can receive more with the same resources but increased efficiency, this will change the attitude toward agriculture itself,” he said. He gestured to a large map of the region’s vast pasture land hanging on his office wall. The 7,200 acres represent huge potential for grazing livestock, but until the cooperative was formed last year they remained largely unused. “You feel sorry for the community when you know you have the potential but cannot use it because of some infrastructure issues,” Hayrapetyan said. He is thrilled that villagers will now be able to take advantage of the land’s bounty thanks to the collective’s installation of seven watering points that ensure that cows don’t have to travel far to find water. More than a mile of formerly impassable road has also been leveled and made functional. Across the country, CARMAC improved 22 miles of remote pasture roads and constructed 116 watering points by the start of 2013. Farmers in Berdashen line up to sell their daily milk. Every morning the truck arrives to take the milk to a local chilling plant. The collective charges its members a little more than half price to rent the tractor, a discount that allowed farmer Edik Minasyan to invest in additional cattle and land. Minasyan expects the more bountiful pasture to increase his cows’ milk production by 50 percent, a figure that has convinced him to plan to grow his herd from two to 15 when he has the money. He would also like to increase the amount of land he cultivates, something he was reluctant to do before because he could not harvest it on his own. But now that he is part of a collective, he can count on its members to help him, and he will do the same for them. “Working together is much more efficient than working alone,” he said. Heifer Armenia’s Sardaryan agreed. One of the problems with agriculture in post-Soviet Armenia is the fragmentation of farms. In a country the size of Maryland, there are 340,000 small farms. Alone they are inefficient and expensive, said Sardaryan, but when they pool their resources and work together they are more efficient and cost effective. In Berdashen, in the snowy mountains in the north, the benefits extend beyond agriculture. During the long winter the collective’s new tractor was able to rescue trapped motorists. 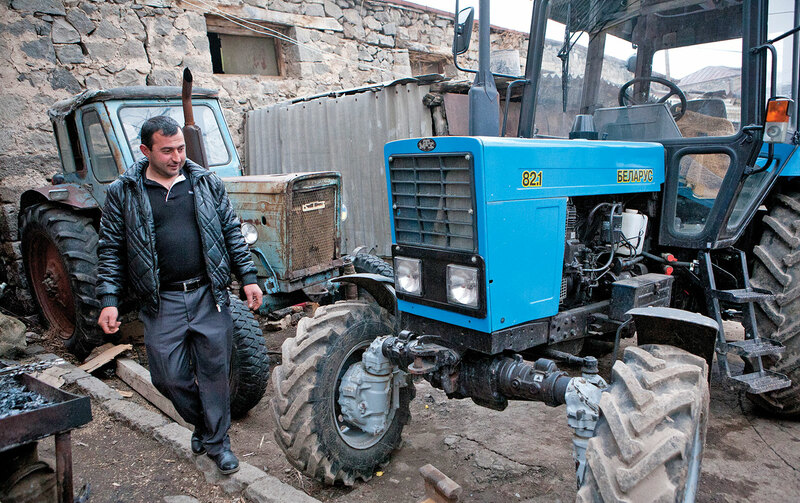 “This is the village savior,” collective president Yervand Akhtskhetsyan said of the tractor. Without it, maintaining pastures and providing fodder for livestock would be impossible, he said. In the cold of winter, the streets are empty except when the dairy milk truck appears. Then the road is lined with villagers carrying pails waiting to sell their milk. About half of Armenia’s 950 communities engage in livestock breeding. At present CARMAC covers 55 of these communities, but hopes to expand to 55 more in spring 2014, said Khachatryan with the Ministry of Agriculture. The second stage of the project will help unite small-scale farmers into milk producer associations that can then be linked to major processing markets in the country. “We consider this project as kind of a pilot project for Armenia,” he said. Making Kashil in Armenia from Heifer International on Vimeo.